We’d love your help. Let us know what’s wrong with this preview of I Love Dirt! by Jennifer Ward. 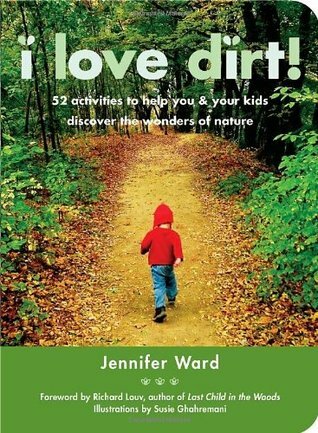 To learn more about the author, Jennifer Ward, visit her websi I Love Dirt! presents 52 open-ended activities to help you engage your child in the outdoors. No matter what your location—from a small patch of green in the city to the wide-open meadows of the country—each activity is meant to promote exploration, stimulate imagination, and heighten a child's sense of wonder. To ask other readers questions about I Love Dirt!, please sign up. Be the first to ask a question about I Love Dirt! Doğayla iç içe büyüyen çocuklar yetiştirmek istiyorsanız içerisindeki etkinliklerin faydalı bir rehber olacağını düşünüyorum. Bir çoğu birbirine benzer etkinlikler olsa da içlerinde gerçekten çok hoşuma giden etkinlikler de vardı. This is one odd little book. If I had bought this book I would have been so upset. I'm not entirely clear on who the audience is. The subtitle says "your kids"--but the activities are for toddlers. At the end of each activity it tells you its supposed benefits--"Stimulates imagination and relaxation". However, these activities are things kids do on their own. Looking for spiderwebs, counting ladybugs, watching the clouds, looking for bird nests. Kids don't need to be led to these activities. Kids This is one odd little book. If I had bought this book I would have been so upset. However, these activities are things kids do on their own. Looking for spiderwebs, counting ladybugs, watching the clouds, looking for bird nests. Kids don't need to be led to these activities. Kids are naturally curious, naturally imaginative, and naturally playful, they do NOT need to be led to imagination--and if you are leading them, it's not really imagination, is it? And then there are the warnings: try to designate play clothes that are allowed to get dirty! ; Do not hold or handle ants of any size; remember to wear sunscreen and a hat; never try to hold a spider; make sure the sun is not shining directly in anyone's eyes; layer and bundle your kids. The very simplistic explanations (what a blue moon is, how ants smell, what is wind, what are leaves, etc etc) are at a toddler's level, not the parents. Any parent (or older sibling!) who does not already know these things is not the sort of person who would ever buy this book. Also--this book is assumes you live in the northeastern US. It rains in spring, snows in winter, you have cardinals and blue jays, birds migrate to warmer areas, there are lots of deciduous trees, and summer is the most comfortable season to be outside. I love nature and tend to spend a great deal of time outdoors. Heck, I'm scrambling to write this review before I am on the dark side of the internet moon while camping later today. This summer, some friends and I put together a little "nature club" for our kids (ages 1-6). I picked up this little book from the library hoping it would spark some ideas and activities for our little ones. Unfortunately, I wasn't inspired because I think most of the 52 activities have been done naturally with our k I love nature and tend to spend a great deal of time outdoors. Heck, I'm scrambling to write this review before I am on the dark side of the internet moon while camping later today. This summer, some friends and I put together a little "nature club" for our kids (ages 1-6). I picked up this little book from the library hoping it would spark some ideas and activities for our little ones. Unfortunately, I wasn't inspired because I think most of the 52 activities have been done naturally with our kids. Many reviewers have stated that this book is not for the outdoor enthusiast, but rather for families looking to devote more time to the great outdoors. I totally agree. If you're already a nature lover, don't bother reading this book because you could have written it. However, if you haven't spent much time outside with your kiddos, this book will get you off to a great start. As the title suggests, this books provides 52 project ideas to introduce children to nature. The description does mention the projects are "open-ended", but to me, I found them too vague. The projects included things like searching for rocks of varying shapes and sizes; puddle splashing; and stargazing. These are all worthwhile activites, however I was expecting more detailed projects. This would be a good book for families who don't get outside much, and want to start with basic activities. It wo As the title suggests, this books provides 52 project ideas to introduce children to nature. This would be a good book for families who don't get outside much, and want to start with basic activities. It would also be good for slightly older children would be able to better comprehend and understand some of the science-based discussions the book promotes. the only thing I don't like about this book is how it tells what specific skills your child is "supposed" to be learning with each activity, for example: "stimulates observation skills and awareness of and curiosity about the living world". it feels like this was added by an editor to satisfy all the baby einstein parents, when the whole message of the book is to allow your child to enjoy and discover nature in a joyful way, not to satisfy some lesson plan. Some great activities in here. Save your time. The whole book can be boiled down to this: "Go outside and look around." Or, alternatively: "Let your kids do what kids do naturally when you don't allow them to sit in front of electronics all day." One idea (out of 52) that I did like: naming the full moons after something significant/traditional you do as a family that month. This book contains simple and clear instructions for parents or caregivers to enhance the awareness and understanding of the kids about the nature around them by asking engaging questions. It is divided to various chapters on trees, birds, leaves, ..., providing hints on what questions we could ask our kids to enhance their curiosity and attention about a particular phenomenon. For example, when it comes to birds, we can ask our kids to pay attention to the size of the birds, the differences bet This book contains simple and clear instructions for parents or caregivers to enhance the awareness and understanding of the kids about the nature around them by asking engaging questions. It is divided to various chapters on trees, birds, leaves, ..., providing hints on what questions we could ask our kids to enhance their curiosity and attention about a particular phenomenon. For example, when it comes to birds, we can ask our kids to pay attention to the size of the birds, the differences between songs they sing, their colors, or the form of their beaks. I picked this up seeking inspiration for getting myself and my children into nature. The book is divided into seasonal activities that introduce a variety of topics. Some of the ideas are impractical for California, but for the most part there are great ideas to spring from. This book is aimed for younger children with parent direction. The first of a series of books written by Jennifer Ward and illustrated by me, aiming to inspire families to spend more time in nature & the outdoors. The second book (Let's Go Outside) is due out later this year. This is a nice book for parents who want ideas and suggestions for spending time in nature with their kids. Learning made fun. I Love Dirt! would be a great book for a teacher or kid's group leader who wants to lead kids in semi-structured outdoor activities. But what's really important is just to spend time outside. And generally, the more unstructured or child-led that time is, the better. The book does encourage going outside, observing something, and giving a mini science lesson based on what you and the child you are with have observed. This is good as far as it goes, but again, I think what's even better to strive I Love Dirt! would be a great book for a teacher or kid's group leader who wants to lead kids in semi-structured outdoor activities. But what's really important is just to spend time outside. And generally, the more unstructured or child-led that time is, the better. Activity ideas separated by season. I think this book would be best with 6-9 year olds. The activities are easy, not much prep, if any, required so I would consider it open and go. A lot of them are things some kids may naturally do in nature if they're used to being outside (which a lot of kids aren't these days so they might need more adult guidance which this book provides) but it's nice to have for when your mind goes blank and the question prompts keep the discussion going. Tanıtım bülteninde yazdığı üzere 4-8 yaş arası çocuklara doğa deneyimi kazandırmak amacıyla hazırlanmış ve bence amacına ulaşmış bir kaynak. Okurken basit izlenimi verse de farkında olmadan ebeveyni de bilgilendiriyor ve farkındalık oluşturuyor. Doğa deneyimleri edinmek için iyi bir başlangıç kaynağı. Öncesinde; Doğadaki Son Çocuk isimli eseri okumanızı öneririm. Cute little book that gives you easy ideas on getting outside and exploring with your kids. It is divided into seasons. There are ideas, discussion questions and answers. More geared toward using toddlers. I thought I was going to get ideas from this other than- Take your kid outside and hike. We already do this. We already talk about everything we are seeing and play with all the dirt, leaves, and trees. This would be a great book to own and pull out for a weekly activity. The activities are short, give probing questions. This would be great for those days when the kids are bored. Any old science class or farm school has this stuff covered. Great ideas for infusing nature inquiry into each day. Lots of great ideas to get you and your child(ren) exploring nature. Quick and straightforward read with lots of great and realistic ideas for enjoying nature with your little ones. I was able to make a list of things to try. Very simple activities to do with children probably around 2-5 years old. Really really quick read. Picked it up from the library today and read through it in one sitting. It could be summed up by saying, "go outside. Look around you: what do you hear, smell, see. Okay now play." I'm thankful this is a library book because there was just nothing new or creative. I'm surprised to say that I found this surprisingly depressing. We are so out of touch that parents need to read a book like this to know what to do with their children outside. We don't need to say, "what do y Really really quick read. Picked it up from the library today and read through it in one sitting. It could be summed up by saying, "go outside. Look around you: what do you hear, smell, see. Okay now play." I'm thankful this is a library book because there was just nothing new or creative.